R/V Atlantis cruise AT18-16, ROV Jason images. Cruise intentions are to characterize the geology, geochemistry, microbiology and macrobiology of two new hydrothermal fields on the Mid-Cayman Rise: The Piccard hydrothermal field at ~5000m depth near 18° 33'N, 81°43'W and the Von Damm hydrothermal field at ~2300m depth near 18° 23'N, 81° 48'W. 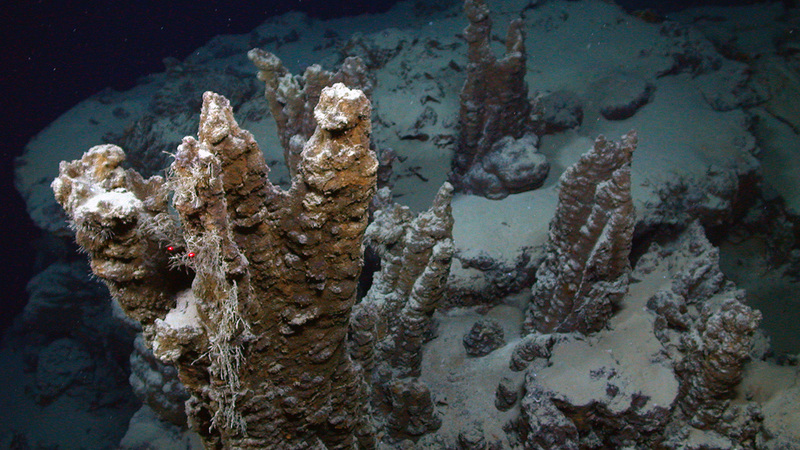 Cameras aboard the remotely operated vehicle Jason took these images of hydrothermal vent chimneys jutting out from the seafloor on the Mid-Cayman Rise, miles below the surface of the Caribbean Sea.